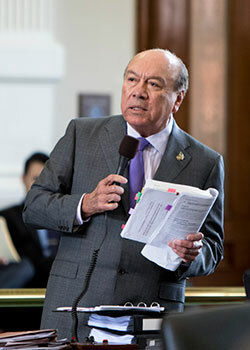 Senator Juan "Chuy" Hinojosa of McAllen was the chief sponsor of the bill to reform the Office of Inspector General at the HHSC. (AUSTIN) — The Senate passed a bill Tuesday that seeks to revamp the state agency that investigates fraud, waste and abuse in Medicaid and other state health services. The Office of Inspector General at the Health and Human Services Commission is supposed to act as a watchdog over state healthcare services, but Senator Juan "Chuy" Hinojosa of McAllen said the agency was rife with problems. During its very first Sunset review, he said, the Commission found the OIG had no set procedures for investigating allegations of fraud and abuse and was often slow and ineffective. "The OIG's investigative process lacks structure, guidelines and performance measures to ensure consistent and fair results," said Hinojosa. Investigations that should have taken months stretched into years in spite of a budget increase of 30 percent since 2011. This means that payments meant to go to providers could remain in limbo, in some cases up to 10 years, while the OIG investigates. Hinojosa led efforts to craft a bill to overhaul the agency. SB 207 would require the OIG to establish priorities and guidelines for investigations into allegations of fraud and abuse. It also limits the office's ability to place holds on payments in non-fraud cases, and clarifies that simple technical or clerical errors do not constitute fraud. It sets down a timeframe for investigations, requiring the Inspector General to complete preliminary investigations in 45 days and to fully close cases within 180 days. It also schedules the agency for another Sunset review in six years to ensure that the reforms implemented in the bill are effective in improving the office. Also Tuesday, the Senate approved a measure to rein in what are called patent trolls. These companies raise revenue by filing spurious patent infringement lawsuits, often against small businesses. Companies can feel pressured to settle with the company rather than endure a long and costly patent lawsuit. SB 1457, by Jacksonville Senator Robert Nichols, would empower the attorney general to go after these patent trolls and seek injunctions and impose penalties. In committee action Tuesday, the Senate Finance Committee sent a bill to the full Senate that would create a sales tax holiday for firearms and hunting supplies at the start of hunting season. The holiday would fall on the last weekend in August. Bill author Senator Brandon Creighton of Conroe says the timing is meant to give Texas retailers an advantage over Louisiana, which has a similar tax holiday on the first weekend of September. Items including guns, hunting blinds, firearm cleaning supplies, archery equipment, gun safes and cases, and rifle scopes would be covered under the bill. 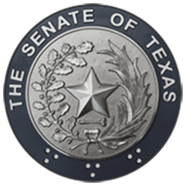 The Senate will reconvene Wednesday, April 22 at 11 a.m.